Music Therapy for Veterans with PTSD and TBI | Crockett Foundation - Tag In & Help Out! Some people have a hard time picturing someone in the military, or someone who’s now a Veteran, doing something expressive and creative like playing music. The military doesn’t appear to outsiders to be a highly creative and expressive industry. I remember when I first read about Songwriting With Soldiers, the charitable organization that works with US Military Veterans to help them express themselves through songwriting and playing their music. They’re Grammy Award winning writers and musicians and it’s based out of Austin, TX. I couldn’t imagine a cooler Veterans charity. It is so innovative in concept and creative in nature. Transitioning from active duty to civilian life can be eased and greatly enhanced for a Veteran by being involved in music. This young Veteran explains that he wanted to learn to play the piano as another means of treating his service related disabilities and difficulties. He explains that from a TBI he’s got a 4 centimeter section of his brain that doesn’t work properly and he needed a way to get around that and relearn things in life. When a community, in this case the military medical center, offers art and music to service members it becomes a means of cultural collaboration in addition to a clear illustration of rallying together in support of their healing. Making music, and playing instruments, can help calm the soul of individuals suffering from PTSD related anger management concerns. One of the reasons that music therapy – learning the guitar in particular – is good for Veterans with PTSD is that it demands use of both sides of the brain. When learning to play the guitar the student can’t think about other things while concentrating on picking the guitar to learn cords. The left side of the brain is considered to be more logic centered while the right side of the brain is said to be more creative in its purpose. Learning to play guitar is one of the few disciplines that cause a person to focus so intently using both sides of the brain. That challenge, particularly as we age, take courage to tackle. It brings the Veteran outside of their comfort zone, causes them to focus and therefore experience relief from PTSD, and it brings joy of achievement and music to their lives. 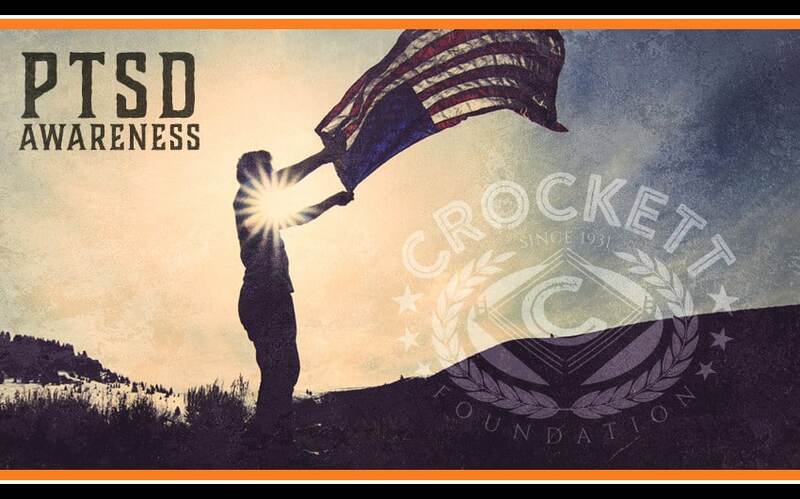 The Crockett Foundation’s mission is to support the best Veterans charities by making donations to help sustain their programs working directly with our military Veterans. You may partner with the Crockett Foundation by donating here. Having a Service Dog: Learn about Service Dogs in this Crockett Foundation post here.